After the ball rolled through Buckner's legs, it was picked up by right field umpire Ed Montague, who put a tiny "x'' near a seam to mark it. Montague then gave the ball to Mets executive Arthur Richman. 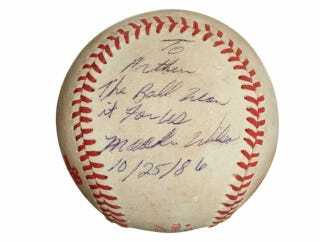 Wilson signed it to Richman, writing: "To Arthur, the ball won it for us, Mookie Wilson, 10/25/86." As the ball made its way around the clubhouse, someone kissed it, leaving a tobacco stain. Charlie Sheen bought the famous ball for more than $93,000 in 1992. Swirsky purchased it for nearly $64,000 in 2000. The ball went for up for auction today in Dallas, and an anonymous buyer paid $418,250. So Swirsky makes a nice little 554 percent ROI on the ball, and Buckner has already been forgiven by Red Sox fans. Everybody wins! Of course, it should be noted that Swirsky also put up for auction the hat Jose Canseco was wearing when a ball bounced off his head for a home run in 1993. It sold for $11,950. That's right: Someone paid almost $12,000 for a hat once worn by Jose Canseco. Well done, America.